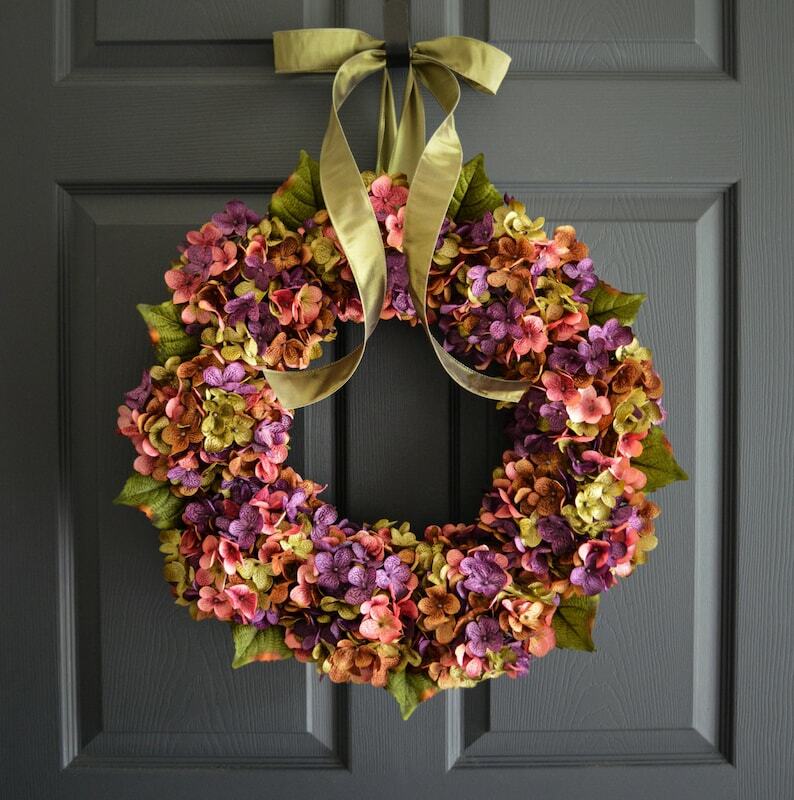 Fall Decor: Uniquely Blended Hydrangea Wreath that embraces true natural colors. 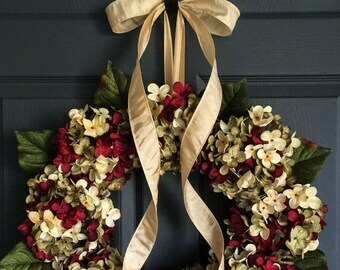 An exquisite handmade wreath with a balanced blend of artificial hydrangea flowers. The wreath is finished with a green color ribbon. This wreath purchase comes with a complimentary door wreath hanger. A heavy duty thin metal door wreath holder coated with a black color finish or White color finish. Measurements are 7/8 inch wide by 12 inches tall. Use for inside and outside doors. What a gorgeous spring day to receive and hang my beautiful wreaths! Thank you Janell, they were worth the wait. I’m so sorry about your Father-in-Law. I am amazed how quickly I received my order considering what you and your family have had to go through with losing a loved one. Thank you again, your work is beautiful! The wreath is beautiful, I love it! I am sorry you feel the wreath is not worth the money. 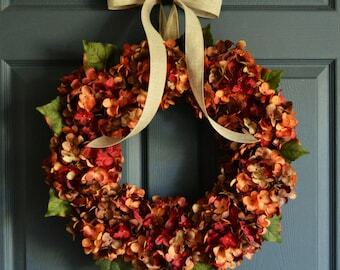 It is one of my popular wreaths for the fall season. All my wreaths are made with the highest quality of material and are hand crafted with care. My blended hydrangeas are all individually blended by hand. I do understand not everyone will be satisfied with their purchase that is why I do have a return policy if you are not satisfied with your purchase. But I haven’t heard from you that you wanted to return your wreath. I do thank you for your purchase and your opinion. Wreath was as described. However, did have issues with on time delivery. I contacted the shop owner the day after the last day expected to ship, based on the posting. She apologized, but essentially said due to her busy season she was running behind. Again, I had to contact her because the box had not shipped several days later (a shipping label was created, but the box was never received by the USPS). After I reached out to the owner again, she said she had a “call out” to her shipping facility to investigate the delay. I had to ask her again for an update... the saga continued. I would have preferred her being more proactive in communication with me regarding “delays,” especially after the initial conversation. The wreath eventually arrived, but I would not purchase again from the vendor.